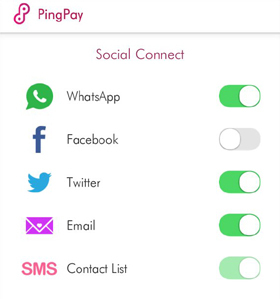 Ping Pay – Imagine how good it is if you can send or receive money via WhatsApp. Well, your imagination is turned into reality. Now you can use Whatsapp, Facebook and Twitter for transferring money to anyone in the contact list. Axis Bank, India’s largest private sector bank has recently launched wonder app called “Ping Pay”.Ping Pay is Multi Social Payment App which allows you to ask or give money or send recharge using WhatsApp, Facebook and Twitter. You can also send customized messages containing text, images, video and voice note along with money transfer. The best part of this App is that anyone can use this App, it is not mandatory to become Axis bank customer for using this App. First of all you need to download and install Ping Pay on your Smartphone. Once the App is installed in your mobile it will ask you your bank account number. You need to enter account number only at once and same can be set as default for all subsequent transactions. Next step is to add your social networking accounts like Whatsapp, Facebook and Twitter. Now to send or receive money or mobile recharge select person from your social network contact list and enter the amount which you want to send or receive. If you initiate money transfer you will receive an auto-generated sender code which you need to share with the receiver. Once he/she (receiver) enter this code money transfer can take place. To receive money/recharge, the receiver bank account needs to be IMPS enabled. Total 75 Banks are IMPS enabled. Ping Pay is absolutely free and no charge is applicable for transfer of money or for recharge. Ping pay is claimed to be secured. This app also requires MPIN at every login. What can you do with Ping Pay? Axis Bank customers can do following using this app. Non Axis-Bank customers can do following using this app. So what are you waiting for start using Ping Pay Now! If you are already using Ping Pay app do share your experience with all other readers!